A Literary Odyssey: Book 108: Finished. It takes a lot to shock me, but I was open-mouthed by the end of this book. I did not expect what happened to happen. The images were so powerful and visceral that I was just blown away! Definitely my second-fav Hardy so far (I doubt anything will pass up Native). Where I found he pushed the envelope a lot was in religion. He goes against religious edicts and says that Jude and Sue are both right in what they do, contrary to religious opinion. And he makes them right. He shows the religious parts for what they are, and he makes the religious creeds the cause of unhappiness and downfall. I think his blame on religion is what really caused much of the outcry. Except for Far From The Madding Crowd (haven't read the Mayor), all 4 books I've read by Hardy have a tragic ending. With Jude he just pushed it even further. He wanted to shock and shock he did. I don't think he did it just for the shock value either, but I'm also not sure about your view about the characters. I'm more inclined to believe he had a political/moral agenda and just found the best way to teach us that lesson, e.g. terrible things happen to innocent people because of society's pressures. It's safe to say this one shocked me. It was the first Hardy I'd ever read, so I didn't know that he was so well known for tragic endings. I agree with your comments about the characters needing these horrible things to happen to move their lives in a specific direction, but I was still so frustrated with some of their decisions. I wanted them to be happy so badly. Like you, this one definitely made me a Hardy fan for life. This was a tough one - completely heart wrenching. If you want something comparable, try reading Tess. These are the top two of the 3-4 Hardy titles I've read and it will also leave you breathless. 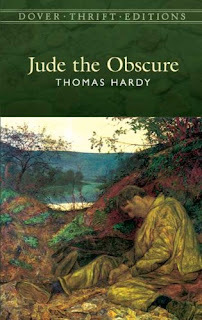 I found it very interesting that even Hardy's wife turned on him after reading this novel. When I think of 'poor Jude', I always equate it to 'poor Hardy'. You just want to reach into the book or the ether and give them both a hug. Your post has me wanting to re-read this book. When I read it the first time I was much younger and my take-away (at least what I can remember now, almost twenty years later) was how much I identified with Jude in the early parts of the book. I fancied myself something of an 'amateur scholar' at the time and was more concerned with his educational pursuits than "all the tragedy." I wasn't a huge fan of Tess, but I think I'll try this one out soon. I'm dying to know what happens at the end! I don't think I have ever felt a desperate need to pick up any Hardy - I have 'Return of the Native' hidden away somewhere in the study (at least, I'm pretty sure I do...). Now I actually want to read something by him because it sounds exciting, not just because I think I should! Thanks! I loved this book and had the same reactions to it that you did. Great review. I recently read this one too and absolutely loved it. I had no intention to read Hardy, but one of my friends insisted and I'm so glad she did. I was reading on the subway when I reached the shocking moment, and I quite noticeably gasped and clapped my hand over my mouth! It really does rip you apart. Your review is wonderful, as always. But the one thing you didn't mention that I will forever associate with the book is the powerful connection he feels to Christminster (aka Oxford). I just had one of my fellow Oxford students read the passage when Jude first enters Christminster, and I could not imagine a more apt description. I'm glad you enjoyed the book!